My latest novel, Rain on Neptune, is now available! 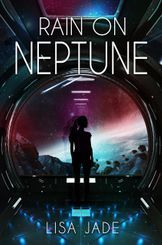 Rain on Neptune is available now on ebook! Welcome to LisaJade.net, home of my various writing projects. I write primarily Science fiction, centring around minor romances, dystopias and post-apocalyptic themes. To date I have released one book, a futuristic adventure novel called The Lumis War. My second novel, dystopian adventure Clover, just released on 10th March 2017, followed by my third, Rain on Neptune, on 1st September 2018. I also share novellas and short stories on the Short Stories page. Feel free to have a look around the site, download and read any of the previews or shorts that catch your attention. And you can also find me on Facebook and Twitter by the links to your right. I'm easily contactable via lisa@lisajade.net and I absolutely love to receive your comments and opinions. Feel free to browse the site and I hope you enjoy!